Can you say “I’m in charge!” because Max certainly is! Max is the result of a breeding decision we knew would yield great results. He inherited the exceptional traits of his parents, with the look of his sire, Golden Sovereign, son of Snowmass Legacy Gold. 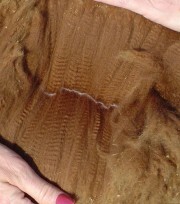 Combined with his dam’s density, his fleece is crimpy with a soft handle (18.1 micron with min=16 and max=20.9 and holding well). Max is quickly recognized by his head! 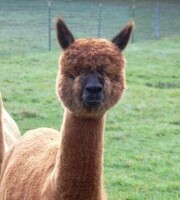 It catches everyone’s eye as well as the judges at the North American Alpaca Show and the Maryland Alpaca Show. Both loved his true to type look; one commenting what a nice male he will be for a breeding program and the other praising his fine fleece. Max took blue in a shorn class the judge described as very tough. Max was described as “stunning” in how straight his legs are and commented that both his front and back legs were “impeccable”. At the Empire Alpaca Extravaganza the judge placed Max in first for his overall conformation, style and fineness of his fleece. 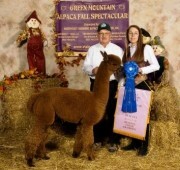 And at the Green Mountain Alpaca Fall Spectacular Max again took blue as well as Reserve Champion where he was up against some outstanding breeding programs! In the yearling class, the judge, stated he was the most complete in a very strong group, praised his density, soft handle, excellent length and coverage and well conformed, solid frame. When presenting comments in the color championship, the judge reiterated her appreciation for his full package. In 2009 Max continues to be awarded blue with similar comments at the NAAS about coverage, fineness, conformation, capacity and was the judge’s “automatic first” of the class and a complete package.